There are two fetish elements to this piece. One is the lovely block of wood that reads like a landscape. The other fetish element is the late model car. I used tension to create a sense of movement, so that the moment feels kinetic and fluid. The woman, conservatively attired in an old fashion dress, reminds me of an early Cindy Sherman photograph. The image of a movie still, the hint or suggestion that this is part of some larger narrative. The car is listing, as if the woman is stuck or stranded. 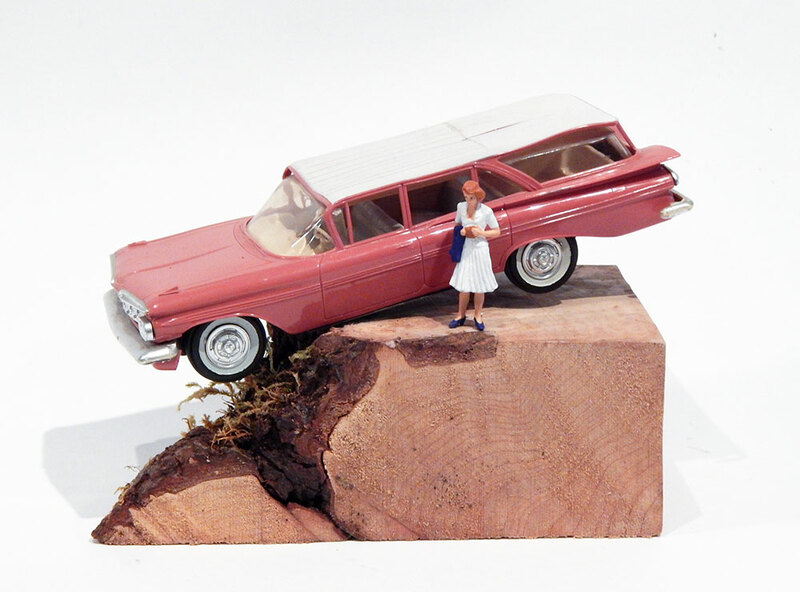 The car is a metaphor—a symbol—and the title suggests a narrative. Life can be like that; we have our plans, but often life isn’t what you plan, it’s what you do. Life is full of such serendipitous moments. An inconvenience can sometimes turn into something wonderful; it depends on perspective and expectation. I like creating pieces like this, an open-ended narrative that keeps telling new stories.